Come down to Kokanee Ford in Creston to see the redesigned 2017 Ford Escape. With a refreshed exterior, innovative features and outstanding fuel economy, the Escape is the perfect SUV for life in the Kootenays. Click here to see the current inventory of 2017 Ford Escapes at Kokanee Ford. Some drivers want maximum fuel efficiency, while others desire more punch at the pedal. That’s why the 2017 Ford Escape offers three engine choices: the 2.5L with intake variable cam timing (iVCT), standard in the Escape S (FWD); the highly efficient 1.5L EcoBoost, standard in Escape SE, and available on Escape S (4WD); and the higher-performance 2.0L Twin-Scroll EcoBoost engine is standard in the Escape Titanium, and available in the Escape SE. Both EcoBoost engines feature Auto Start-Stop technology. And now, thanks to this year’s increased 61.7L fuel tank capacity, you enjoy more time on the road and spend less time at the pump. 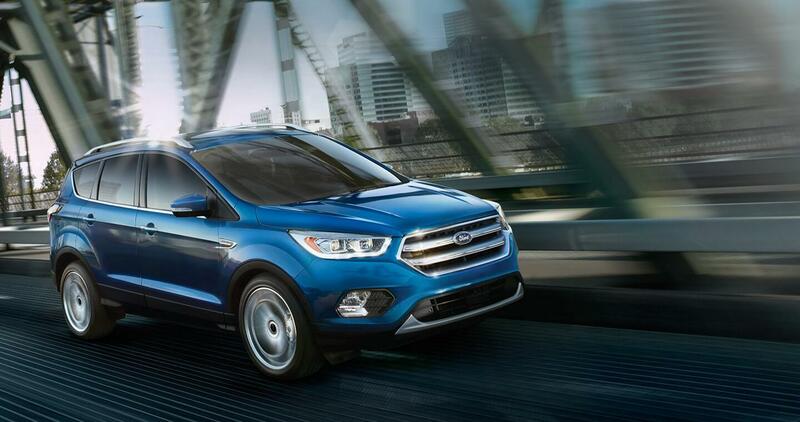 The new Ford Escape is ready for anything! Available features such as HID headlights, fresh new wheel choices and the Sport Appearance Package, add instant ready-for-whatever appeal. The interior is designed around you, with a host of comfort-minded amenities including an available heated steering wheel, available leather trim and more. 60/40 split folding rear seat backs, standard in all models, provide the people/cargo-carrying flexibility you look for in a versatile SUV. To help keep you safe while behind the wheel, the 2017 Ford Escape has available features such as, SYNC3 with voice activated features, Adaptive Cruise Control, Lane-Keeping System, Enhanced Active Park Assist, BLIS with Cross-Traffic Alert and more. These handy features will make sure that your full attention is kept on the road at all times. The 2017 Ford Escape is smarter than ever. The available technology features can do just about everything. Newly available SYNC Connect allows you to start, lock, unlock and locate your vehicle from virtually anywhere using your smartphone. With an Available Foot-Activated, Hands-Free Power Liftgate, there is no need to fumble with keys to open this liftgate – just kick your foot under the rear bumper. The Ford Escape has been a favorite of active families in the Kootenays for years and we welcome the opportunity to show you around the 2017 Ford Escape in Creston.